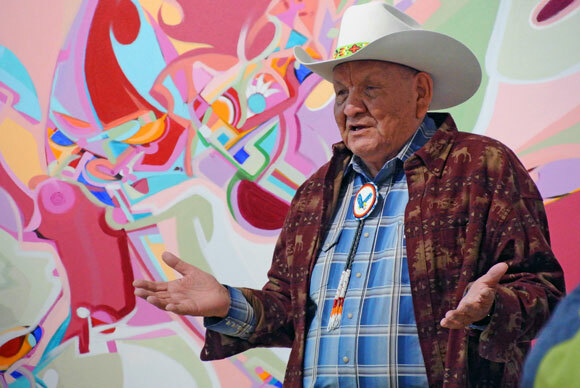 Celebrated Aboriginal artist Alex Janvier is UBC’s artist-in-residence. Alex Janvier, one of Canada’s most iconic Aboriginal artists, arrives at UBC Okanagan for two weeks as artist-in-residence. During his residency at UBC from October 4 to 17, Janvier will convert the Fine Arts (FINA) Gallery into an artist studio, producing new paintings in a spirit of community and collaboration. The public is invited to visit the gallery from Monday to Friday, 2 to 5 p.m., to see the artist at work over the course of his stay. There will also be an opportunity to view more of Janvier’s art, as the exhibition 7: Professional Native Indian Artists Inc. featuring his work opens at the Kelowna Art Gallery on Friday, October 17, running until Sunday, January 4, 2015. Born of Dene Suline and Saulteaux descent in 1935, Janvier was raised in the nurturing care of his family until the age of eight. Then the young Janvier was uprooted from his home and sent to the Blue Quills Indian Residential School near St. Paul, Alberta. Although Janvier speaks of having a creative instinct from as far back as he can remember, it was at the residential school that he was given the tools to create his first paintings. Unlike many Aboriginal artists of his time, Janvier received formal art training from the Alberta College of Art in Calgary and graduated with honours in 1960. Immediately after graduation, Janvier took up an opportunity to instruct art at the University of Alberta. In 2012, the new Janvier Gallery opened on Cold Lake First Nations 149B, which is located north of the City of Cold Lake, Alberta. While Janvier recognizes the work of Russian artist Wassily Kandinsky and Swiss artist Paul Klee as influences, his style is unique. Many of his masterpieces involve an eloquent blend of both abstract and representational images with bright, often symbolic colours. As a First Nations person emerging from a history of oppression and many struggles for cultural empowerment, Janvier paints both the challenges and celebrations that he has encountered in his lifetime. He proudly credits the beadwork and birch bark basketry of his mother and other relatives as influencing his art. As a member of the commonly referred to “Indian Group of Seven,” Janvier is one of the significant pioneering Aboriginal artists in Canada, and as such has influenced many generations of Aboriginal artists. By virtue of his art, Janvier was selected to represent Canada in a Canadian/Chinese Cultural Exchange in 1985. Although he has completed several murals nationally, Janvier speaks of the 450 metre-squared masterpiece entitled Morning Star at the Canadian Museum of Civilization, as a major highlight in his career.